‘Preparing to Dive’! The Captain announced on the intercom. The ballast tanks were being flooded with sea water as the sub slowly submerged into the depth of the Red Sea. Just a few moments ago we had entered the comfortable Yellow Submarine through a narrow gangway, berthed alongside in the beautiful resort town of Eilat, in Israel. It was like being a part of James Bond movie in the real life! The adrenalin pumped in excitement of my first dive in a submarine, meant for tourists! I along with the other three Indian, two Israeli and one Italian friend had checked out of the hotel on the earlier day. Luigi, the Italian, agreed to drive the car hired for a weekend trip to Eilat. The city is at the south most tip of Israel and is around 400km away from Tel Aviv. It is flanked by the port of Aqaba on the Jordanian side and village Taba on Egyptian side. These cities can be viewed from Eilat on a clear day. The city's beaches, nightlife, Marine Park and other attractions including alluring desert landscapes make it a popular destination for domestic and international tourists. We drove through the arid Negev desert where one can see sprawling sand dunes for miles! It is a melange of brown, rocky,dusty mountains interrupted by wadis( dry riverbeds that bloom briefly after rain) and deep craters. One can occasionally sight a local tribesman called Bedouin.The sun shone strongly and the weather became hotter as the day progressed. We had a brief stopover at the towns of Beer Sheva and Dimona before reaching Timna Park. This place is located 30 km short of Eilat. It has some of the most wonderful multihued volcanic rock formations, sandstone columns which are a nature’s creation! They appear vibrant with color as the sun rays dance around to give a feel of descent of a rainbow on the ground. One can collect at least a dozen samples of colored sand here which have been formed, with erosion of these volcanic rocks, as a souvenir! We reached Eilat in around six hours and checked in the hotel to retire for the day. Next day after breakfast we reached the Coral World Underwater Observatory. One can see the marine life like stingray, turtles and sharks from close quarters here. The safety and comfort is assured using advanced technologies and an experienced crew. The Submarine leaves the Underwater Marine Park, and slowly moves to deeper water, to a depth of 60 meters. The submarine has viewing windows of Perspex which transported us to a whole new world! In this journey one experiences the slow changes in light levels, the color and underwater life at different depths. The different color of water and variety of marine life in the Red Sea is a rare display as a direct consequence of the sun-light that reaches the different depths. In its course, the Submarine traverses the steep "Wall of Corals" that reaches to a 45-meter depth. The beauty of the corals and the underwater-life, including school of multicolored fish, the sea horse, octopus and many more acquatic creatures are on display, just as the nature created it. The submarines also goes around a sunken ship wreck covered with barnacles! The area marked for the dive is a natural reserve. Fishing, coral extraction and fish feeding is illegal in this area to preserve the fragile natural balance between the different forms of life under water.The submarine has three different crew men: the captain, the captain's helper, and the Stewardess that explains and describes the different stages of the journey as it happens. Next we went to see the Dolphin’s show at the Dolphin Creek where watching dolphins performing and swimming with the tourists is a great fun. keeps reminding me of the lovely experience! I have never been into a submarine. It's a bit scary for me! But from your wors I see that it must be a great experience! nice..specially the vibrant yellow color! WOW! I thoroughly enjoy reading your travel stories. They make me want to travel more! wow must have been fun! 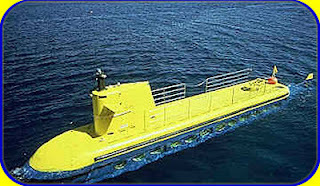 I have been to submarine in Australia but this yellow submarine is amazing. nice to know about it and I liked as well as enjoyed reading your travel post. Wow - what a fabulous experience! Would have loved to see pictures of the beautiful landscape you have described. Wow! Have a nice time! @ Francesca R- It is amazing! @ Rachit- True! It was an absolute ball of a time! @ Harman- It is definitely worth taking this trip once! @ Magic eye- Certainly, great fun! @ Simran- Welcome to my blog! Thanks for liking this one! @ Lady Fi- It was a great experience! @ Eden- Thanks a lot! I think there is one in Australia itself! @ Purvi- Sure! Must visit if you get a chance! Your creative genius will take you places!! Oh wow, sounds like an epic adventure! I think I may be claustrophobic on a submarine, is it? All of it does sound adventurous, exciting and fun! Beautifully described, loved reading it! @ Sam-It is meant for tourists so it is very comfortable and there is no claustrophobic feeling! Thanks PhilO! It is fun and you must travel whenever you get the opportunity! i once visited a submarine in our college tour... dat was kept only 4 public visiting... we saw many compartments... its really cool..
@ Kalai- So nice to learn that you saw a submarine and liked being on board! @ Megha- I spent so much time in Navy that it was like going back home! :)You must see one..
@ SprigBlossoms- Thanks a tone for that lovely comment! the title only gave a big smile on my face. I wish to have this experience at least once in my life time !! Thank you Jyoti, for those bouquet of words! Hope you too experience this! wow what an amazing experience- I have never been in a submarine and I'm not sure I would want to be in one- but how exciting for you!! What a great travel story. It would have been nice if you put the pictures of the places you described.